It is a situation which is becoming the norm. A rescue in the Mediterranean, followed by a period of waiting whilst Italy and Malta refuse to open their ports and then a solution, of sorts. As in previous cases this year, four countries have now come to the aid of the 64 migrants on board the Alan Kurdi on Saturday. The group of 64 migrants were rescued 10 days ago, on April 3, they have been waiting ever since for a decision on their fate. In the interim, two women were taken off the ship for medical treatment on Malta, which left 62 waiting on board. 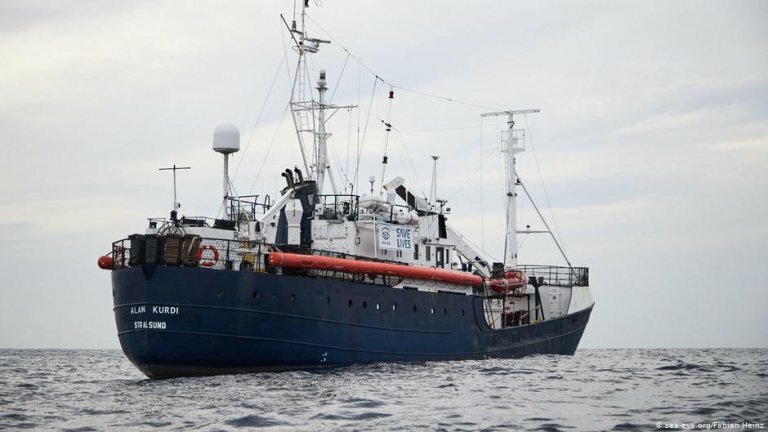 According to the German non-governmental organization, Sea Eye, which runs the Alan Kurdi, conditions had been worsening and the crew and migrants were running out of food and water. On Friday April 12, the French government announced that it would accept some of the migrants. Then three more countries stepped forward, Germany, Portugal and Luxembourg. The migrants were originally rescued off the Libyan coast which is why the governments of Italy and Malta have continued to insist that they are not responsible for disembarking the migrants; since the rescue took place in the Libyan Search and Rescue (SAR) zone and therefore the Libyan government should be responsible. The EU commission was asked to look for a solution to the issue. On Saturday the Maltese Prime Minister posted on Twitter: “None of the migrants will remain in Malta, the smallest member of the European Union […] which cannot shoulder this burden alone.” In fact, the Alan Kurdi will not even be allowed to dock in a Maltese port. Instead, the migrants will be taken off the ship by Maltese ships and brought to land before being transferred to one of the four host countries. In an additional tweet, he confirmed that Italy had stood shoulder to shoulder with Malta throughout the stand-off and “now people were starting to take notice across Europe.” He added that the German NGO's actions were "dangerous." Quoted in the Italian daily newspaper Il Messaggero, Salvini reiterated that the NGOs needed to realise that they weren't "above the law" and that Italy and Malta "should not be left alone" to deal with the situation in the Mediterranean or be expected to disembark everyone in their countries. He promised that they would continue to hold to their line in future situations as well and would continue to fight against people smuggling in the region.